The 35th Infantry Regiment Association salutes our fallen brother, PFC Arnold Benjamin Lackie, RA11145984, who died in the service of his country on September 1st, 1950 in South Korea. The cause of death was listed as KIA. At the time of his death Arnold was 22 years of age. He was from New Bedford, Massachusetts. Arnold's Military Occupation Specialty was 4677-Military Policeman. The decorations earned by PFC Arnold Benjamin Lackie include: the Combat Infantryman Badge, the Purple Heart, the National Defense Service Medal, the Korean Service Medal, the United Nations Korea Service Medal, and the Republic of Korea War Service Medal. NEW BEDFORD -- The flag flying from atop Old Glory Tower in the citys North End during April is being flown as a tribute to the five Lackie brothers. The servicemans flag being flown this month from the tower, a patriotic landmark overlooking Route I-195, is the 324th flag to fly from the tower since the inception of the custom in September 1971. One of the brothers, Pfc. 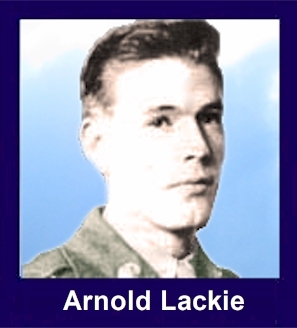 Arnold B. Lackie, was the first New Bedford soldier killed during the Korean War. Lackie, 22, was serving with the 25th Infantry Division as an ammunition carrier when he was killed on Sept. 1, 1950, while delivering ammunition to foxholes along the Naktong River near Pusan. Lackie had enlisted in the Army toward the end of World War II and saw military service in occupied Japan. He re-enlisted in 1948. Lackie Square at Ashley Boulevard and Tarkiln Hill Road was named in his memory in 1951. The actual servicemans flag atop the tower is that of Arnolds older brother, Paul Lackie (now deceased), who served in World War II. Three other brothers -- Philip Lackie, David Lackie (now deceased) and Richard Lackie -- also served in the Korean War. Pfc. Arnold B. Lackie grew up in the city, attending the Jireh Swift School and Normandin Junior High School. Enlisting in the Army at the age of 17 toward the end of World War II, Arnold saw military service as a paratrooper in occupied Japan as a member of the 11th Airborne Division. He re-enlisted on his 21st birthday in 1948. He was serving in the 35th Infantry Regiment of the 25th Infantry Division as an ammunition carrier when he was killed on Sept. 1, 1950, while delivering ammunition to foxholes along the Naktong River near Pusan. He was 22 years old. Mr. Lackies parents received a letter from Gen. Douglas MacArthur, in which he wrote: "The untimely and tragic loss of your son, Arnold, who met his death on the field of battle in Korea, has shocked all of us deeply. Some measure of comfort may be derived from the knowledge that he died in the service of his country and in the defense of a peace-loving people." Lackie Square at Ashley Boulevard and Tarkiln Hill Road was named in Mr. Lackies memory in 1951. He was the first city soldier killed during the Korean War.